A little bit later than scheduled here’s the next release. This time the number of new features is smaller than in previous releases but there still some small nice additions. Let’s look into it. The new release comes with Eclipse 4.2M5. I also looked into up-dating the subclipse integration but at the moment the newest version is only provided for win32/64 and so I’m waiting until I can consume it from upstream. All other components (xtext, egit and mercurial) are unchanged. As promised since the beginning. At the very moment the JavaFX 2.0 team provides builds for Linux e(fx)clipse will provide all in one downloads (one was able to install from the p2-site since the beginning). The JavaFX 2.0 Linux build provided is for 32bit and so is the e(fx)clipse all in one version you can download. 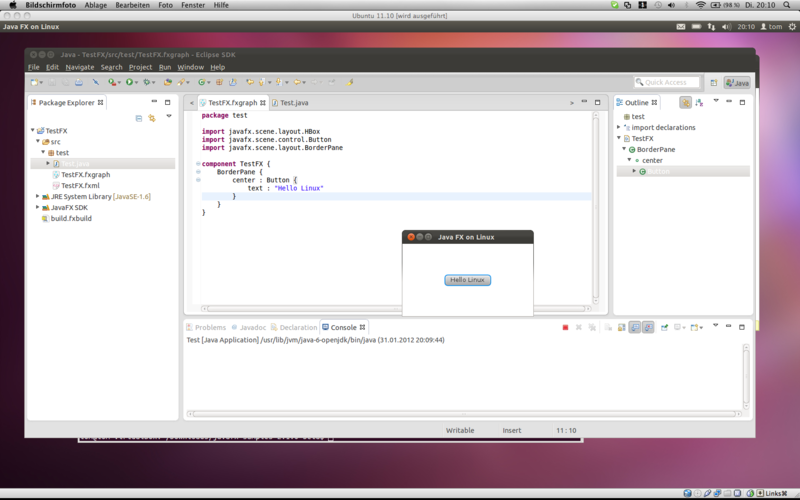 The linux support though is still a bit limited – the live preview (JavaFX-SWT-Integration) crashed my Eclipse instance. It’s not really easy to follow which CSS-Attributes are added and sometimes the docs are not correct so if you encounter an attribute you definately know is working but the CSS-Editor marks it as an error file me a ticket. Thanks to Sebastian Zarnekow’s blog this was a piece of cake. Elements who mark one for their properties as the @DefaultProperty are now respected and you can omit the attribute-name for them making your the file more readable in many situations – whether you make use of this feature is up to you. In this release it only received bugfixes. If you want to help with it file bugs, send me patches, … . 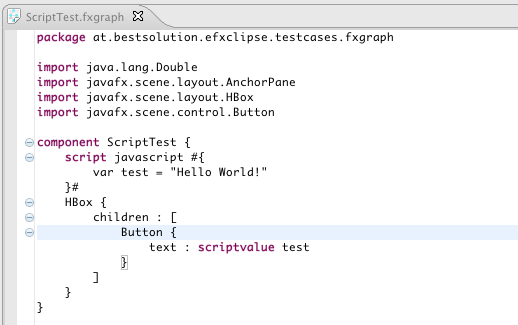 I’ve started working on SVG and FXG to FXML-Converters as I already outline in one my last posts my plan was to add them to e(fx)clipse to allow you converting those external formats to JavaFX 2.0 representations. You should not expect a lot for it as of now because they are in a very very early stage and as outlined in the above post JavaFX 2.0/2.1 (at least for SVG which I looked a bit closer) won’t provide enough API to implement a fully compliant convert as of now. The main purpose to add them already today into e(fx)clipse is to receive feedback from you on problems you encounter. I hope you share the source SVG and FXG drawings with me or even provide a patch? An interesting sidenote on this is that technically I’m transforming the source formats into an EMF-Model (there’s a specific one for SVG and one for FXG) and then do the conversion using xtend (a Eclipse and Java-Developer should get started with xtend within 30 minutes because the tooling feels so similar to your JDT-Editor). Just one final sentence on FXG: Adobe if this is really the spec of a format I’m happy I never had work with your stuff – take a look at SVG-Spec on how I expect someone to define a (graphic) format. I’ve been receiving more and more mails to my private account and I’m always grateful to help but to not only put the burden on me I decided to open a google-group where people can ask questions, others can help too, … . I’ll try to update the fxgraph-reference as well but you know I’m doing this in my spare time and so things take time. If e.g. you mastered the first steps in fxgraph and want to share your findings, don’t hesitate to send a message to above group. I’ll plan to add an extra page to http://efxclipse.org so that people have a central place to find informations. I’m happy for reviews in blogs (even if there are things you don’t like about e(fx)clipse I want to know them). You can find the new group at: http://groups.google.com/group/efxclipse. Come, join and bring up ideas to make e(fx)clipse a success. Thanks a lot Tom, we a re following your work with attention and we are seriously considering using it for our next generation products. Is it possible to see your EclipseCon Conference via Web? As far as I know there are no live streams – at this years EclipseCon Europe though most talks have been recorded and provided later on. In case you need support (on professional base or none professional) just let me know. If you are building products on top of Eclipse frameworks I can only suggest that you get to EclipseCon US/Europe to see what’s going on and chat with the developers directly. Thanks for the compliment – as far as I know Netbeans 7.1 also got JavaFX 2.0 support. 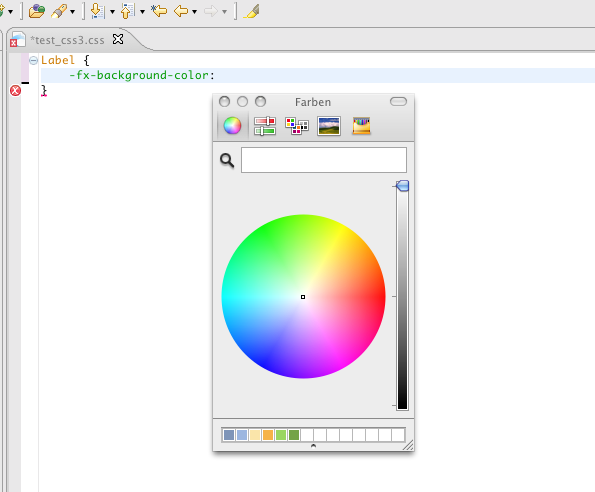 I think the main advantage in Eclipse is that I have Xtext which makes writing things like the CSS-Editor a quite simple task whereas in Netbeans they first had to add CSS3-Support to the CSS-Editor itself beside that e(fx)clipse has the advantage that it is not part of a big product with long release cycles. One thing I know for example the Netbeans integration is a lot better is when it comes to example applications. I’ll have to take a look if I can add them as well to e(fx)clipse but that heavily depends on the license. I agree, this stuff looks really promising and even ahead of most other approaches. For example, I couldn’t find any JavaFx 2 script language with code completion already available. Please someone correct me if I’m wrong? 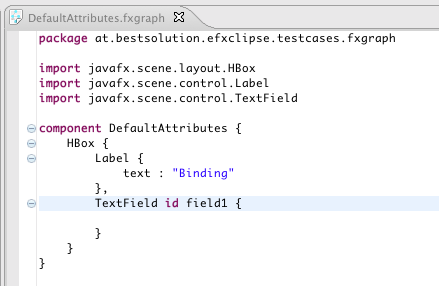 We are also considering to use e(fx)clipse with FXGraph for a new project. I’m wondering how much of the JavaFX 2.0 API is already covered/supported? Ah now I see, excellent, thank you. So this means FXGraph (ps: why not call it FXON? :)) is pretty much complete and usable and it’s only the FXML (can do without) and maybe the CSS parts/editors, which might still have some things missing? CSS is fairly complete as well – at least all currently known attributes are included. The FXML support is alpha quality but will get improved by factoring out the common bits from FXGraph. The really big topic for the next release is the implementatio of a runtime application framework on top of Eclipse 4 Application Platform. But I’m currently encounter a problem … I can’t create a new “JavaFX” plug-in project. Indeed if I make a new “JavaFX project” it’s “classic” project, and if I create a new Plug(in project base on the JavaFX exemple Exemple the Manifest contains errors in the Import-Package section which contains all javafx packages… (Unsatisfied constraint error). could you tell what’s wrong please ? By the way if there’s a better way to ask this kind of question please tell me ^^ google group maybe ? You should better ask at https://groups.google.com/group/efxclipse – it looks like it is unable to locate the javafx.jar – Did you set the location of the JavaFX-SDK in your preferences (you need to restart your Eclipse afterwards)? Could you please include a m2eclipse as well for the integration build? I could but the problem is that this would make the downloads even bigger and I’m not sure whether this is really needed. You can easily install it afterwards. Anyways if you file a trac-ticket. It will not get lost and if many people would like this I’ll naturally include it. 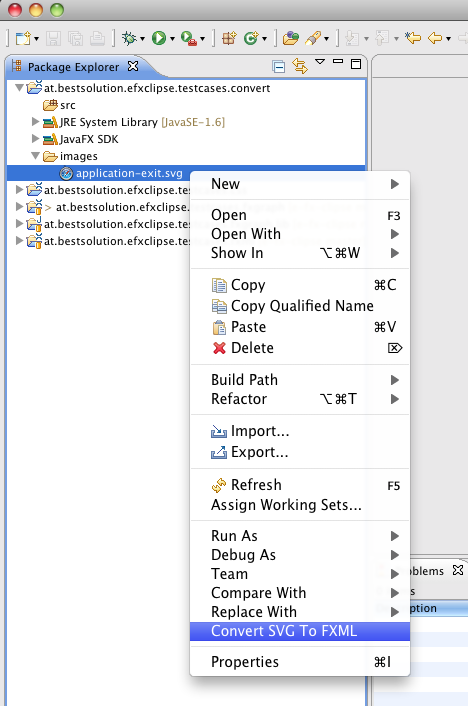 Last week Eclipse 3.7.2 were released so I update to It (I dowloaded the JEE version) and installed e(fx)clipse 0.12 plugin, but something has been changed (or broken) in eclipse that makes e(fx)clipse not work at all. No JavaFX item appears in the configuration tree in. I would appreciate if you give me an updatesite URL for eclipse 0.12M5 istead of 0.11. As I suspected, the troubble was my e4 updatesite (I used the e4 0.11 version). 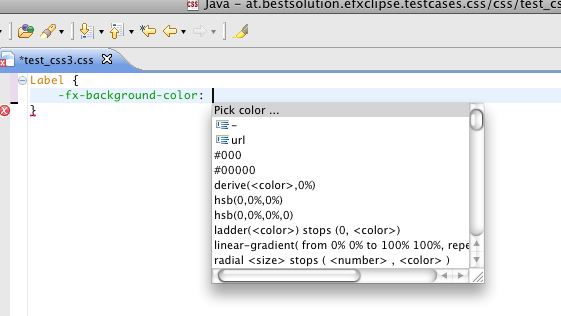 With e4 0.12M5, the e(fx)clipse plugin now works fine in eclipse 3.7.2. Thanks.